Ok, here is what I am planning for the tangential input. I have a small drill press in my laboratory that I used to drill the hole tangential to the interior wall. I saw this a while back and I thought it was really interesting. If you haven’t played with cornstarch and water then you are missing out and you should drop what you are doing and go do it! DO IT! Cornstarch and water looks like a liquid when you are moving it around, but when you touch, or poke it with your finger it act more like a solid. It’s pretty fun! Ok, now that you went and played with cornstarch you can watch this video. So I finally was able to get into my little workshop and setup the machinery to insert the brass nozzle into the prototype laminar nozzle. Just to recap for the rest of us. I had a manufacturing company that I know make this fabulous brass nozzle for me. I finally got the parts last week and have been itching to get to use them but life has gotten in the way. I’ve been working on this project for about 1.5 months and have had some pretty steady progress, but this nozzle really takes the design to the next level. Here is the before pictures of the nozzle WITHOUT the brass nozzle insert. Notice the water veins in it that are coming right out of the exit? They disappear as the water travels on, but it adds to the turbulence and if there is enough flow the water will begin to break up. Here are the pictures with the brass nozzle insert. This is a low flow rate, but it is comparable to the flow rate in the previous pictures. This is my favorite picture notice the ASSESENCE of the water viens!!! Absolutely CRYSTAL CLEAR LAMINAR FLOW! Work on building a tangential inlet. It is my belief that if I add the tangential input I will be able to increase the range without the water breaking up to about 4 times greater than what it currently is. When parts arrive, assemble the 1st build. 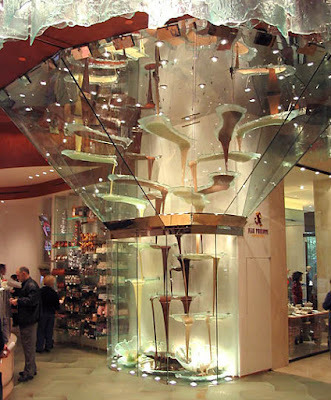 Couldn’t resist thinking about engineering this decadent display at the Bellagio. Read about it here. The chef says it works just like a water fountain…hmmm…laminar chocolate anyone? So, I’ve made some new friends on this journey to the laminar fountain! I am proud to introduce you to Mario the Magician. He really is a magician in more ways than one! First it really is his career in Switzerland, but more importantly he is a WIZARD with laminar flow fountains! With his permission, I’ve uploaded a video of his fountain. He has done a remarkable job, and I just can’t believe the quality of his fountain. The water doesn’t have a imperfection in it!!! FLAWLESS COMPLETELY FLAWLESS!!!!!! Ok, so he built a fountain that shoots out a prefectly clear stream of water without a flaw in it…SO WHAT! Well, not only did he built the fountain, but he also built the electronics from stratch, and programmed it all from stratch all while learning everything he could about the fountains online!!!!! I am continuously astounded by his ingenuity and BRILLIANCE. This video shows the flow from the fountain and its different modes. I can’t say enough about MARIO! Thanks for sharing Mario! The internal edge is very sharp and could cut your finger. I’m sure that this will do perform well. I can’t wait to test it, but I’m still waiting on some other parts. I received my PMMA Optical Fiber yesterday. It only took 4 days to get halfway around the world to my secret laboratory! The fiber optics is PMMA or plastic. It is 3mm thick with no PVC coating on it. I couldn’t afford the PVC coating. I was surprised at how rigid the cable is, granted I understand that is it SOLID, but it still took me off guard. If I let go of the reel the 3 or 4 loops would spring off. I can’t wait to play with it! Do anyone know how to polish the ends? Can I just use the buffing pad for my dremel?